The last few days have not gone well for Karnataka-born batsman KL Rahul, both on and off the cricket field. A few weeks earlier, his controversial appearance on the chat show Koffee with Karan led to him getting banned by the CoA and BCCI. 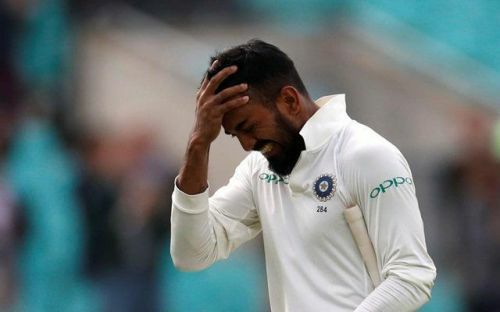 However, that ban was lifted a few days ago and today, KL Rahul made his comeback on the cricket field for the India 'A' side in the third unofficial ODI of their series against the England Lions. India 'A' won the toss and elected to bat first, with skipper Ajinkya Rahane opening the innings with the returning KL Rahul. The captain was sent back to pavilion off the very first ball of the innings by L Gregory, which brought Hanuma Vihari to the crease. Vihari and KL Rahul tried to stabilize the innings by trying to build a partnership but they could put together only 33 runs as James Overton dismissed KL Rahul in the 8th over. The returning Rahul managed to score only 13 runs off 25 balls as his failures with the bat continued in Thiruvananthapuram. The right-handed batsman had been struggling before his ban as well, but looked in good nick today as he hit 2 boundaries against the England Lions. It seemed like he was set to make an emphatic return to cricket, but he was soon nipped out by right-arm pacer Jamie Overton. With the World Cup coming closer and closer, KL Rahul needs to return to form as soon as possible in order to claim a spot in the Indian side for the tournament. He still has 2 unofficial one-dayers against the England Lions to return to form and his fans would be praying that Rahul returns to form sooner rather than later. Meanwhile, India 'A' have been bowled out for just 172 runs. Chennai Super Kings all-rounder Deepak Chahar emerged as the top scorer of the innings with 39 runs, as the top order failed to contribute much to the total. For the England Lions, Jamie Overton picked 3 wickets giving away only 34 runs in his 7.1 overs. India 'A' are 2-0 up in the 5-match series and would be looking to seal the series as soon as possible.